The University of Pennsylvania’s Perelman School of Medicine, located in the heart of Philadelphia, is a major center of biomedical research and education. Also commonly known as Penn Medicine, the school recently built a state-of-the-art broadcast studio to produce massive online open courses (MOOCs), along with other training and demonstration videos for physicians and nurses. 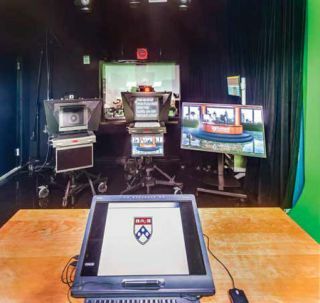 UPenn’s Perelman School of Medicine’s new broadcast studio allows them to record course lectures, education and training videos, and more for the school’s vast online network. To ensure the studio was equipped with the best technologies, New Jersey-based integrator VCA was brought in to help design the AV system for the studio. “It was about a $900,000 project. Our job was to take care of the control room, studio, lighting—everything was purpose-built for their needs,” said Charlie Ruban, VCA account manager. Working closely with VCA was Charles Bears, UPenn’s director of media technology and production, who helped VCA fit the studio design to their needs. VCA wanted to film in 1080p resolution, so they chose to include Sony broadcast cameras mounted on Vinten pedestals, AutoScript Epic prompters, Shure wireless microphones, TBC consoles, and an LED lighting grid and fixtures. In the control room, a NewTek TriCaster 860 was installed, along with Sony Professional displays, SxS digital recorders, Evertz terminal equipment, and Tektronix signal measurement. One of the other features in the new studio is a fiber matrix control room that is set up to allow connectivity throughout the school, bringing together what’s going on in the studio with conference rooms, lecture halls, and classrooms. “It gives us the ability to have a two-way interaction with the school,” Bears explained. The original space wasn’t designed to be a studio, which created some significant challenges for VCA as they began designing. One of the biggest was acoustics, as the studio is surrounded by glass and overlooks an Amtrak train line. Since the studio’s completion, Bears said he’s very happy with the result. Kelleigh Welch is managing editor of Systems Contractor News. Follow her on Twitter @kelleighwelch.